Post subject: Too much motor? So I have been sitting on an old jon boat for some time now, and decided with the winter coming on, I would start getting it back in working order again. It's an 18' shallow hull and I acquired a 65 hp Mercury for it. Is that too much motor for it? I had already planned on redoing the transom and putting some pods on it. Just curious what a few of the more experienced fellers on here thought. Just curious what a few of the more experienced fellers on here thought. Hmmmmmm ... is your life insurance policy current? I don't mean to be so sarcastic , my apologies. 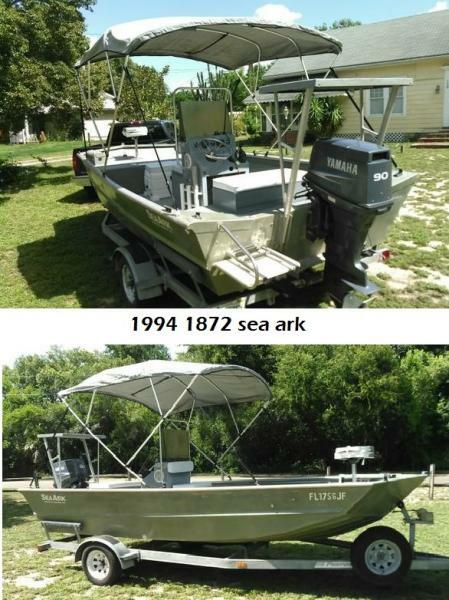 OK, I'm not a jon boat guy and I didn't sleep at the Holiday Inn last night, but I did check some OEM catalogs from the late 90s for 18' jon boats and 40hp is listed as the maximum rating. But then again, a new 2016 year Lund jon boat model 1852 (75" beam, 20" transom, 475-pound hull weight) lists 65hp as max OB for remote steering and 45hp for a tiller motor. My earlier catalogs don't differentiate between a controls or tiller motor, so I'd go by specs (beam/weight etc.) and cross-reference to something similar to yours. My Tracker III is nothing more than a 1648 jon hull and it's rated for 60hp on the sticker FWIW. Here is a boat in my neighborhood that is for sale. as you can see, it has a 90 hp motor on it. any motor you choose will have to be your decision to carry. Plus, checking with your local water police may be helpful. Thanks for the replies fellas. I will giver a whirl and see what happens. What body of water do you boat on? A smallish lake, it will be too much. A river, sounds nice or a larger lake. Open water not so much as you might get pounded to hell.